Watches are something I always include in wishlists and are a bit of a feature in my outfit posts too. I wouldn’t be without one and my current style seems to be the chunkier the better. Quite a challenge for my skinny little wrists! I have two gold and one rose gold watches, so am on the hunt for a new silver one. I’ve always said (and stick by) investing in designer accessories is worth its weight in gold, as they typically last longer and are stylish from season to season. 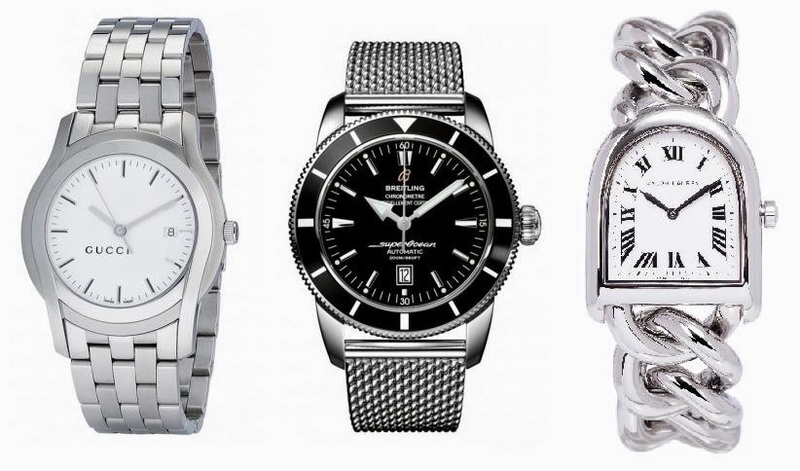 Rambling aside, I’ve picked three of my favourite styles from The Watch Gallery, ranging from attainable to dream watch status. The Gucci one is my favourite I think, as it’s simple but stylish (and comes with a black face too). The Breitling one is beyond my reach, but completely amazing. I’m sure it’s a guys watch, but I’d still wear it as I adore the tougher aesthetic. Finally, the Ralph Lauren has more of a classic feel to it, which I really love. I desperately want a new silver watch, so will be saving up for one as soon as I get a new job! I think silver and monochrome makes such a chic outfit combination, so am excited to find my dream piece to complete that look! The Watch Gallery has so many lustworthy items, so is definitely a place to look if you’re after an investment piece. If you’ve seen any nice silver watches around, do let me know!